There are many different types of online tools that are used as a means to gain insight into the online customer experience. Two highly regarded types of tools are live chat tools and online feedback surveys. So what’s the difference between the two? In this article, we will show you the difference by plunging into the pros and cons of using live chat tools and online feedback surveys as well as providing you with some examples of these tools. Many of you are probably familiar with live chat tools as they literally seem to be ‘popping up’ everywhere these days. So what are they, what do they want and how do you know if they’re right for your business? Well to answer the first question – live chats are exactly what they sound like. They are chat boxes on websites and mobile apps that are designed to solve visitor queries in real-time. To initiate a conversation, many live chats start by asking online visitors if they would like their question(s) answered by an online agent. From a business perspective, they are often seen as a convenient way of communicating one-on-one with your website visitors – on their terms. Must live up to the ‘live chat’ expectation – Visitors will assume responses are timely and if they aren’t for whatever reason, the visitor will leave the site frustrated. Time zone issues – Visitors in other time zones will expect around-the-clock service and therefore require you to have personnel on hand 24/7. Lacks critical insights into the customer journey and how customers experience the website itself. Mainly geared towards gaining insights into customer service performance and customer satisfaction. Olark is considered one of the most popular live chat tools. This live chat tool offers live chat automation (in other words, targeted chat). To implement Olark, all the user needs to do is integrate the code snippet onto their website and it’s ready to go. In terms of customisation, there are lots of options in terms of templates and colours. They even offer holiday templates to grab the attention of visitors. Olark can be hidden when agents are away or users can choose to initiate chats themselves. This tool also collects feedback while the user is away and can create transcripts for conversations which are sent automatically to the user’s CRM. Zendesk Chat is a live chat tool that puts extra effort into its automation features.The appearance of the chat can be customised with different colours and templates. Users can set up automatic triggers for new and returning visitors. All chat logs are stored by default and visitors can even request a chat protocol through the console. 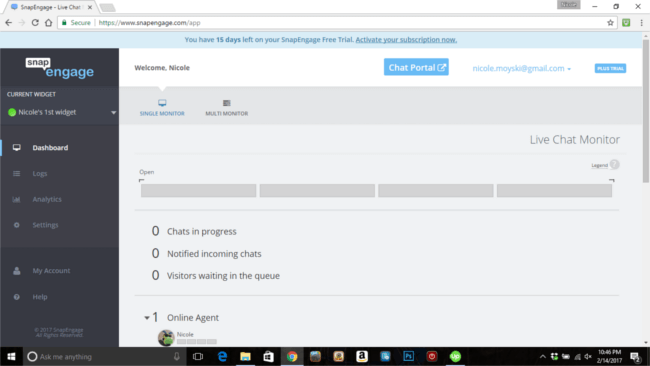 SnapEngage is another very easy-to-use live chat tool. With this tool, users can choose from different chat buttons or upload their own, however intro texts cannot be changed. It also offers a call-back feature for visitors. SnapEngage can be initiated automatically after the visitor has spent a certain amount of time on the page. When agents are offline, the widget can act as a contact form. 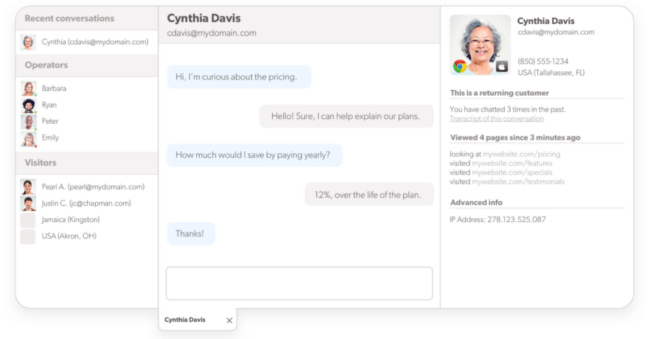 Transcripts can be created from chats and sent to a pre-defined address. LiveChat is a chat and help desk software that is very easy to use. All users need to do is paste a piece of code onto their website and it’s ready. The chat tool on the client side can be customised with your logo and a picture of the chat agent. As for the agent side of the chat, the web interface is nice and clean. 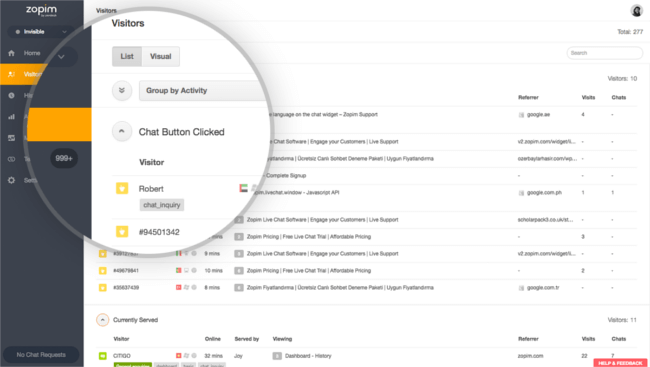 Users can set up ‘proactive chats’ which are triggered based on rules defined by the user. If the user is offline, the chat bar can be hidden or changed into a contact form. All chats go into a ticketing system and phrases defined by the user can be accessed quickly via tags. Online feedback surveys are another popular way of collecting insights from online customers and website visitors. Typically you will find these is in the form of a feedback button (located on the side or at the bottom of the page). However, they can also appear as an overlay (modal) after having been triggered by visitor behaviour. For example, when a visitor shows intent to leave the ordering funnel, scrolls all the way to the bottom of a page or spends a certain amount of time on the page. Be sure to check out our Survey Marketplace for survey advice and templates. Mopinion is a feedback analytics software that helps users to collect, analyse and take action on online feedback. With real-time data visualisation in customisable dashboards and charts, users can extract deep insights into the customer experience. These insights can reveal how your business is performing, for example, in terms of digital content, online sales funnels, user experience and customer loyalty. Feedbackify is an online feedback survey tool that allows users to create feedback forms themselves and collect ratings (such as NPS) accompanied by comments (e.g. compliments or suggestions). All feedback can be viewed in a real-time dashboard and here users can filter by category or subcategory. Kampyle collects and analyses customer feedback in real-time. This online feedback survey tool allows users to track how their visitors experience different parts of the website. Users can also set up triggers to collect feedback in a more proactive manner, e.g. an x percentage of visitors or if the visitor looks like they’re going to leave the webpage. OpinionLab is another well-known online feedback survey tool. 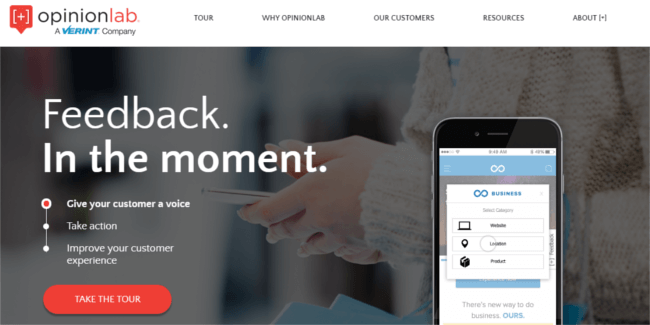 With an initial focus on website feedback, the company has now expanded its reach and now also gathers feedback from channels such as contact centres and physical stores. When it comes to customer experience, both tools serve a somewhat different purpose. While live chat tools focus on quick responses and instant gratification for customers, online feedback surveys aim to extract deeper insights into the online journey and solve long-term issues by analysing root causes and ongoing trends. Our advice? Why not combine them and let them complement each other. Think of it this way, if you have a live chat tool on your site, you can always provide quick customer support and advice to those who wish you contact your business right away. On the other hand, your online feedback surveys will help collect and analyse how you are performing in terms of loyalty, satisfaction and even usability.